It took the UConn women more than half the semi-final game to find their mojo and produce 20-plus minutes of nail-biting competition. But Mississippi State met them basket-for-basket, and Morgan William’s buzzer beater in overtime ended the Huskies’ legendary 111-game winning streak – and created a new legend of her own. Read Paul Doyle’s on-the-ground account here. Hover over the chart below to see the minute-by-minute score. And use the scroll bar or arrows in the bottom chart to see how individual players performed during the 45 minutes of play. The policemen gunned down in Dallas Thursday night join a long and sad list of officers intentionally slain year-after-year in the line of duty. From 1997 to 2015, according to FBI statistics, 1,005 members of U.S. law enforcement members were “feloniously killed” – and a surprisingly large number died in ambushes. Over the last two decades, officer murders peaked in 2011, when 72 were slain. Preliminary numbers for 2015 are far lower: 41. Those numbers are a fraction of all law-enforcement deaths. Intentional killings account for about a third of the officers who die in the line of duty, with many more dying in car accidents and from job-related illnesses. The overall numbers have dropped dramatically from spikes in violence against police in the 1920s and 30s, and the 1970s. While deadly encounters during traffic stop may seem to be the most common scenario in which officers are killed, they account for fewer than one in five slayings. Since 1997, more officers were killed in ambushes – including unprovoked attacks and cases in which officers were lured into danger – than during traffic stops. About one in 13 killings occurred while police were responding to a domestic dispute. Firearms were used in 92 percent of all murders of police since 1997. Handguns were used most often, although rifles and shotguns were used far more often with cop killings than with homicides in the general population. In recent years, about 7 percent of firearm homicides were committed with rifles or shotguns. Among killings of police, long guns were used more than four times as often. 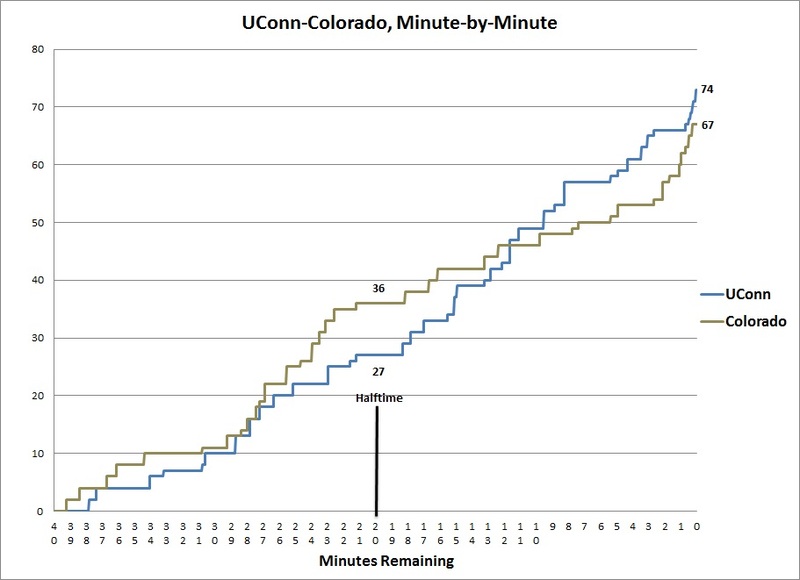 In their first-round game against Colorado, the UConn men’s team was never on top during the first 28 1/2 minutes of game time. But once they took the lead, they never lost it. The hipster coders at the U.S. Census Bureau – yes, they exist – are embracing March Madness once again this year by reviving a bracket game to test your population knowledge. Is Tennessee bigger than Iowa? What about North Dakota vs. New Hampshire? Florida or New York? In six rounds, players earn a point for each correct answer. And each new game scrambles the state pairs for a new challenge. 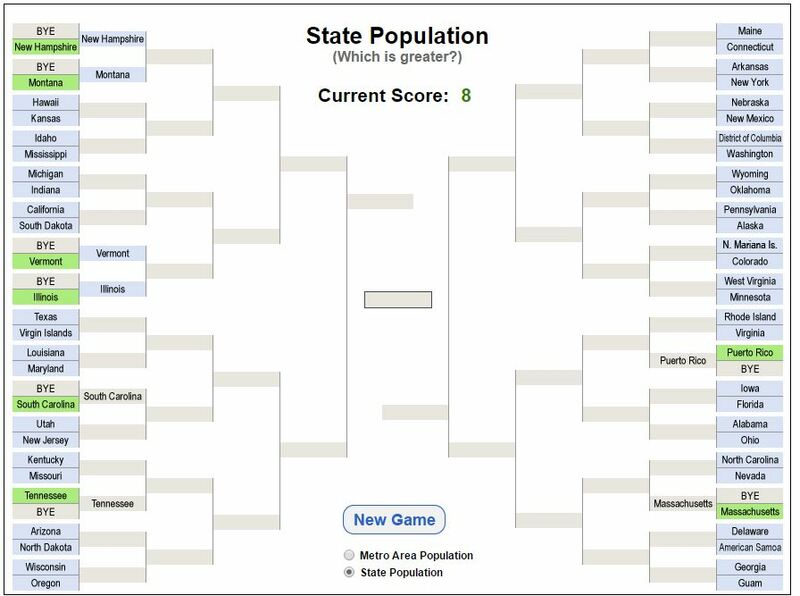 For the extra-competitive, there’s also a bracket game for the 64 largest metro areas in the country. Last week, we wrote about an analysis of the newly released standardized test scores that offered some evidence of a widening gap in the Hartford area between historically high-performing school districts and those that have traditionally had below-average scores. We’ve now expanded that analysis to all school districts in the state, and have found the same general trend: For most subject and grade groupings, school districts that exceeded the statewide average on a key measure of achievement in 2013, reported scores on the 2015 test that were even farther above the state average. Likewise, schools with below-average performance generally lost ground, falling farther below the statewide average. In elementary school math, for example, among the 20 highest-performing districts two years ago, 18 had scores this year that were farther above the state average. Among the 20 lowest-performing districts two years ago, 16 dropped farther below the average. Put another way, the above-average districts in 2013 outperformed the state by an average of 16 percent, while the below-average districts lagged the statewide figures by an average of 11 percent. But in 2015, the higher performing schools had widened their margin to 29 percent above the state average, while the lower-performing schools had dropped to 25 percent below the state average. When the Boston Globe sought records related to crashes involving Massachusetts State Police cars, the agency said it would be happy to comply – for a fee of $62,200. The agency was also willing to release a log of public-records requests – for $42,750. And the Staties told a reporter for the Bay State Examiner that he would have to pay a $710.50 “non-refundable research fee” just to find out how much the agency would ultimately charge for copies of internal-affairs documents. 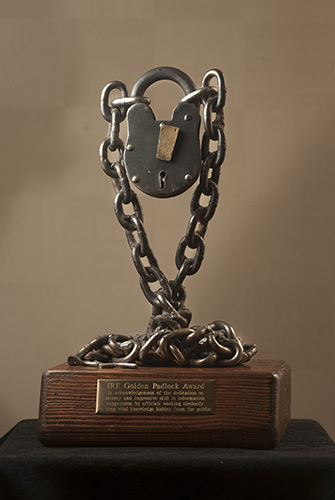 For “habitually going to extraordinary lengths to thwart public records requests, protect law enforcement officers and public officials who violate the law and block efforts to scrutinize how the department performs its duties,” the Massachusetts State Police was named one of four finalists for the Golden Padlock Award, a slightly tongue-in-cheek honor bestowed annually by the journalism organization Investigative Reporters and Editors (IRE). This is the third year IRE has led the hunt for “the most secretive government agency or individual in the United States.” Last year, the award was shared by the U.S. Navy FOI office, which not only stymied efforts by a reporter to obtain information on a shooting spree at the Navy Yard in Washington, D.C., but also accidentally sent the reporter an internal memo outlining the plan to keep records secret; and the governors of Oklahoma and Missouri, who went to extraordinary lengths to keep the public in the dark about problems with prison executions. Joining the Massachusetts State Police as finalists this year are the Colorado Judicial Branch, which keeps records of its spending and disciplinary actions under wraps; The Texas Department of Public Safety, which tried to block inquiries into the validity of its border-security program; and the U.S. Department of Defense, which has stonewalled efforts to learn more about the massacre of 16 civilians in Afghanistan by an Army staff sergeant. The winner will be announced at IRE’s annual conference this weekend. Notre Dame led UConn for just 21 of the 2,400 seconds of Tuesday’s NCAA national championship game. The other 99 percent of the game: No contest. Relive the match with these interactive graphics. The first graphic below is a minute-by-minute chart of the game. Move your mouse over the chart to see the play-by-play progress. 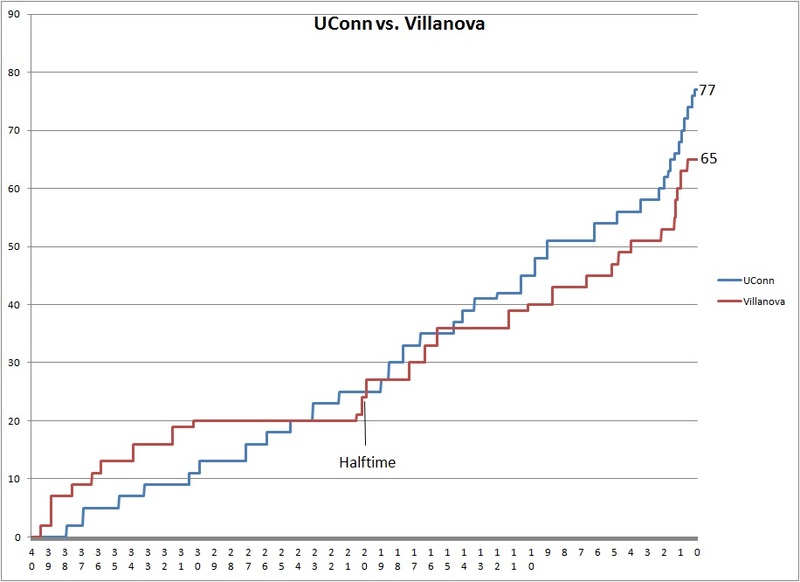 Below that is a graphic showing the point spread in UConn’s favor over the 40 minutes of play. The last graphic shows points scored by every player. Use the slider or the arrows to advance through the minutes of the game, to see how the teams and the individual players performed. After a remarkably slow start, the UConn Huskies roared back against Villanova Saturday night, scoring 14 unanswered points as half-time approached, and never trailing in the last 14 minutes of the game. Below is a minute-by-minute chart of the game, and a separate graphic showing points scored by every player. Use the slider or the arrows to advance through the minutes of the game, to see how the teams and the individual players performed. The inevitable dissolution of the battered Doc Hurley Scholarship Foundation came a step closer Thursday with Judge Carl Schuman’s order barring the foundation from engaging in any official acts while he considers the fate of the once-revered scholarship fund. On April 7, barring objection – and no objection has been registered so far – Schuman may formally eliminate the organization Walter “Doc” Hurley dreamed up four decades ago to help needy high school students reach their college dreams. The foundation – which held more than $1 million in assets seven years ago – is now penniless, and Hurley’s daughter, Muriel, is facing a civil suit brought by the attorney general accusing her of looting the charity. The collapse of the Hurley foundation is on stark display in a series of affidavits filed by nine Hurley scholarship winners who didn’t receive the money they were promised. As part of the Courant’s investigation of the foundation, we tracked down more than a dozen winners who were shortchanged, and lawyers for the state then soon followed up. Utsarga Bhattarai was awarded a $2,000 scholarship when he graduated from West Hartford’s Hall High School in 2008. But he said the money never came. “On multiple occasions, up and through my junior year of college, I contacted the Foundation through multiple telephone calls and e-mails, but never was contacted by the Foundation,” he wrote. That sentiment is repeated over and over. “I sent multiple e-mails and made multiple telephone calls to the Foundation and left messages, but never received e-mails back or any return telephone calls,” wrote Alyssa Cusano, who received $500 of the $2,000 she was promised. Brittany Cavaliere left phone and e-mail messages after her aid stopped. So did Jermaine Thomas and Amanda Trothier. And several other students. But they said they either received no response, or were assured that the scholarship money was on its way. But it never arrived. The affidavits are included in the dissolution lawsuit merely to bolster the state’s case that the Hurley Foundation was no longer operating as a charitable organization and should be shut down. There is no means through that process to make the students whole. State officials aren’t foreclosing the possibility of recovering assets that could be distributed to past scholarship winners. But the foundation’s bank accounts are empty, and finding any seizable assets is proving to be a difficult feat. Gov. Dannel P. Malloy signed an executive order today designed to take some of the massive piles of data held by the state and move them onto an easily accessible website where researchers can dive in. “This data belongs to the people of Connecticut, and this initiative will help make that data more easily and conveniently accessible to them,” Malloy said, expressing a sentiment not always championed by government officials. Agencies have 90 days to come up with that first list. Tyler Kleykamp, who works for the Office of Policy and Management, will l lead the enterprise as Chief Data Officer (not to be confused with the television character “Data,” who was a chief officer of the U.S.S. Enterprise). The initiative builds on the state’s transparency website, which already provides data in searchable and downloadable form on the state’s payroll, pension, contracts, grants and payments. And it’s part of a larger trend of freeing “big data” for analysis by researchers, journalists and business interests. States maintain enormous amounts of data on everything from health care spending to educational performance to highway safety. And more and more of it is seeping into the public domain. “Timely and consistent publication of public information and data is an essential component of an open and effective government,” the executive order proclaims. The way officials interpret those parameters may determine just how public all that public information really will be. They are Sworn to Uphold the Law. So How about Obeying the Freedom of Information Act. ?????????? ????????? on Should Supreme Court Justices Be Held to the Same Ethical Standards as Other Judges?